A day after Turkey’s President Recep Tayyip Erdoğan attacked the “opposition within”, his regime has arrested journalists, former police officers, and TV scriptwriters. More than 20 people were imprisoned early Sunday. The İstanbul Chief Public Prosecutor’s Office released a list of 32 suspects, wanted for “forming, leading or being a member of an armed terrorist organization”; forgery; and slander. Earlier this week, a Government-sponsored bill authorized arrests based on “reasonable doubt”. Among those detained was Ekrem Dumanli, the editor-in-chief of Zaman Daily, associated with the Gülen movement whom Erdoğan sees as a threat to his power, and Tufan Ergüder, the former head of the Istanbul Police Department’s counter-terrorism branch. 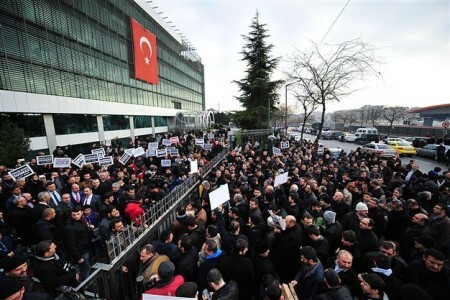 “The free press cannot be silenced,” a crowd chanted at the Zaman offices as police officers from the counter-terrorism department raided the premises. This is a shameful sight for Turkey. Sadly in 21st Century Turkey this is the treatment they dish out to a media group with tens of television and radio stations, internet media and magazines. Samanyolu is also linked to the US-based Muslim cleric Fethullah Gülen, a former ally of Erdoğan who has been increasingly critical of the Government. The President has accused Gülen’s followers of plotting a coup through their opposition networks, including within the police and judiciary as well as the media. Almost 200 journalists were previously held in prison on charges of being a member of a terror organization, violating their right to a fair trial. Journalists are now being detained once again. These developments mean that freedom of the press and opinion are punished in Turkey, which takes its place in the class of countries where the press is not free. Turkey’s Press Council said it is “impossible to legitimize the operation”.